Prof.(Dr.) Rayadurgam Narayana is working as a Principal in Shahaji Law College since July 2005. He did B.Com, LL.B., M.A. (Political Science), LL.M., and Ph.D. in Law from Shri. Venkateshwara University, Tirupati, Andra Pradesh. He did B.Ed from Anna Malai University, Chidambaram, Tamil Nadu. He also did Master of Human Rights (MHR) from Central University, Pondicherry and also qualified UGC-NET. He has total experience of 26 years in teaching as well as administration. Six papers successfully presented in Inter National Seminars, Eleven Research Publications in the Journals ISSN/ISBN, Twenty Three UGC Sponsored National Seminars- Paper Presentation, Eight State Level Seminars-Paper Presentation and Thirty Two Participated in Workshops. Delivered lectures as a Resource Person/Visiting Faculty in the UGC Academic Staff Colleges, Pre IAS Training Center, Government Maharashtra, various Banking Organizations and different Universities, Colleges. He was appointed as a full time professor in Shahaji Law College, Kolhapur since 1985. He worked as incharge Principal of Shahaji Law College from 19/6/1999 to 30/6/2005. He was a member of Academic Council from 1st September 2005 to 31st August 2010. He was also a member of Senate, Shivaji University, Kolhapur from 1st September 2005 to 31st August 2010. He is author of the book, “Legal Language with Legal Maxims”. He has published various articles in different newspapers and peer reviewed journals like All India Reporter (AIR). He has also worked as a Chairman, Local Inspection Committee for the affiliation of law Colleges from Shivaji University, Kolhapur. Also he was appointed as Vice-Chancellor nominee member as Subject Expert under the faculty of law for the appointment of Assistant Professors. Dr. (Mrs.) RASAM SAVITA S.
She is working as an assistant professor in law in Shahaji Law College since 1999. She has worked as joint co-coordinator, Department of Law, Shivaji University, Kolhapur since 2002-2003. 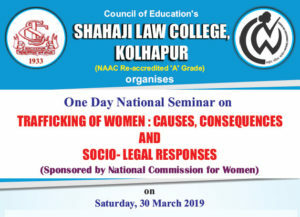 She was working as Co-coordinator of NAAC Peer Team at Shahaji Law College, Kolhapur. She also worked as honorary Legal Advisor on Right to information at Shivaji University, Kolhapur. She is also working as a faculty member at P. G. Diploma courses held at department of Political Science, M. A. Mass Communication, Shivaji University, and Kolhapur. She also is a yoga teacher. She has delivered lectures as a resource person at nearly 40 different places which includes governmental as well as non- governmental organizations. She has published eight different Articles in various peer reviewed journals with ISSN/ISBN publications and has awarded best paper award in one of the papers published in Patron. She has presented papers at 19 different National and international conferences. At present she is working as a panel member in various committees in Shivaji University and other institutions. She was member of B O S and member of faculty of law Shivaji University, Kolhapur for the academic year 2010-16. She also has been a member of co-ordination committee, Law from 2016-18. She has also been a member of internal complains committee at various colleges. At present she is also working as a member of Lapses Committee, Shivaji University, and Kolhapur. She was appointed a Panel Member at various Lok Adalats organised by District Legal Services Authority, Kolhapur. Dr. M. C. Sheikh is working as a Assistant Professor in Law since June 2004. Did his Masters in law from University of Mumbai, Mumbai. He has total experience of 15 years in teaching. He completed his doctoral degree in Environmental Law from S.R.T.M. University, Nanded in July 2011. Awarded Ph.D. Guide-ship under the faculty of law in Shivaji University, Kolhapur since December 2016 also recognised Post Graduation teacher. Four students are pursuing their research (Ph.D) under his guidence. He is co-author of four books of Distance Education of Shivaji University for the M.B.A., Master of Valuation and M.A. Course. Actively engaged in NET/SET, Ph.D. course work organised by Shivaji University, Kolhapur. Appointed Member in Local Inspection Committee by Shivaji University for affiliation inspection of law colleges. His research paper published in peer reviewed journal is 27 including All India Reporter (AIR)and double blind peer review journal of Shivaji University, Kolhapur. He has 06 International, 27 National and 05 State level papers presented and published in proceedings with ISSN and ISBN. Around 48 invited lectures were delivered including the legal literacy camps held at remote rural areas of Kolhapur district. Acted as Chairperson in the National Level Seminar for two times. Appointed Member, Local Inquiry Committee, Council of Education Kolhapur. Appointed panel member of Maha-Lokadalat and Lokadalat organised by District Legal Services Authority, Kolhapur. He is visiting faculty for the paper Media Law and Ethics in the department of Mass Communication of Shivaji University, Kolhapur. His areas of interest are Environmental Law, Property Law, Cyber Law, Administrative Law and Law of Contract. He was Secretary for Chief Lead College (Faculty of Law) under the scheme of Shivaji University for three years during the academic session 2009-2012. He was also IQAC Coordinator of the College during 2014-2016. Appointed as Pro-Vice Chancellor Nominee member for Departmental Research Committee (DRC) Shivaji University, Kolhapur since 2014-15. B.A., DCS, LL.M., NET, Ph.D. He is graduated from Karnataka University Dharwad, Karnataka. He is rank holder throughout. He won prizes at LL.B. and LLM. He cleared National eligibility test consecutively twice in a row. He has experience of 12 years in teaching. His area of interest are, constitutional law, criminal law, sentencing policy, good governance, human rights, research methodology and upliftment of marginalized in right perspective and moot courts. He has authored five books on law and political science. His books on Constitution of India and Drafting, Pleading and Convenyacing have been overwhelmingly received by the stakeholders which is evident by the fact that the two books have gone for second and subsequent edition. He has to his credit more than 30 articles published in repute of national and inter-national journals and books. He has participated in more than 50 national, international and state level seminars. He stood all India first in the case comment competition organized by the Rajiv Gandhi Law University, Punjab for which he won cash prize and certificate. He has worked extensively on the theme of ‘Sentencing Policy in India’ for his doctoral research. He has compared the Indian legal system with that of United States of America and United Kingdom in particular and other common law countries in general for his doctoral thesis. He has organized various activities in and outside the college including three legal aid camps in the remote areas of Kolhapur District. He has delivered guest lecturers in various colleges on the themes of constitution and human rights. He is also associated with district Legal Services Authority in as justice dispensing agent. He has been invited as subject expert on the ‘curriculum development orientation program’ held by the Shivaji University at Sangli. He was invited as resource person for the sensitization program orgnised by the UNICEF, Maharashtra in the Shivaji University, Kolhapur. He has widely traveled to the colleges of Karnataka as a resource person for seminars and innovative events. He has acted as moot judge for national and state level moot competitions organized by various colleges. He had the privilege to sit with High Court Justices and District judges as moot court judge in national moot court competitions. The students of Shahaji Law College represented the Shivaji University in 13th Youth Parliament and won six prizes under his leadership and guidance. He is also serving as Vice President of 14th Youth Parliament Committee of Shivaji University. He is visiting faculty to Ghodavat University, Kolhapur and P G Department of law, Shivaji University, Kolhapur. He has delivered number of lectures as resource person in State, National and international level seminars. He is actively involved in University Exams. He has served as Central Assessment Program director of Law Faculty in Shivaji University. He is serving as head and secretary of various committees of the college. He is serving as NAAC Co-coordinator from the academic year 2016-17. He has been awarded with Doctor of Philosophy under the Faculty of Law by Karnataka University, Dharwad. He have been Completed LL.B. from Law College, Nanded and Post graduation from Department of Law, Savitribai Phule Pune University, Pune. He has 14 years of teaching experience. He is pursuing Ph.D. under the faculty of Law in Swami Ramanand Teerth Marathwada University, Nanded in Criminal Law. He joined as Assistant Professor at Shahaji Law College, Kolhapur in the year 2010. He has actively participated in 27 University / State / National level seminars/ workshops organised by Colleges and University. His 03 papers presented and published in National / International Seminar / Conferences with ISSN/ISBN. He contributed to the society by organizing 15 free legal aid and advice camps at various remote places. He works as a panel member of lok-adalat. He organises different activities in College campus for the overall development of the students. She is working in Shahaji Law College since 2011. She has completed her LL.M. in Department of Law, Shivaji University, Kolhapur and presently pursuing Ph. D. from Shivaji University, Kolhapur on Right to Education. She has actively participated in 25 different seminars/ workshops/ conferences arranged by different institutions. She has published 9 papers in peer reviewed journals having ISSN numbers. She has successfully conducted legal aid camps at Kanneri and Vadanage. She has arranged various study visits to Talathi, Tahsildar office as well as Sales Tax Department etc. Mr. S.S. Desai is working as full time Assistant Professor from February 2012. His areas of interest are Contract Law (General Principles), Professional Ethics, Company Law, Alternative Dispute Resolution System and Labour Laws. He has completed LL.M. from Pune University specialization with Administrative and Business Laws. He has qualified National Eligibility Test (NET) in Law as well as in Social Work. He is registered for Ph.D. in Law at North Maharashtra University, Jalgaon. He has participated in 31 International, National, State, University and local seminars/conferences and his 05 papers have been published in ISSN/ISBN National and International Journals. He had visited and delivered lecture to LL.M. students at Department of Law, Mumbai University and under graduate students of law course of Siddharth Law college, MGM Law College, BCT Law College and various other law colleges affiliated to Mumbai University. He is also actively engaged in NET/SET, coaching course work organised by Shivaji University, Kolhapur. In year 2014 Mr. Desai has individually orgnised Legal Aid Camps at New Karanje, Tq. Radhanagari, Bhadole Tq. Hatkanagale and Ch. Rajaram Sugar Factory K. Bawada of Kolhapur District under the scheme of National Legal Services Authority (NALSA). He is very associated with District Legal Services Authority (DALSA), Kolhapur and frequently, invited as a Panel Member to National Lok-Adalat and Maha-Lok Adalat. He is also been good active in social work. She is working in Shahaji Law College since 1st October 2011 as Assistant Professor in Political Science. She has completed her higher education in Shivaji University. She actively participated in the MUNA held in the University. As a student she was a part of the Parliamentary Training Programme for Meritorious students conducted during the Winter Session of the Maharashtra Legislature at Nagpur. She has in all 17 yrs of teaching experience out of which 6 years is as Full time and 11 years is as CHB. She has currently submitted her Doctoral Thesis entitled, “Impact of Gandhian Philosophy on Contemporary Social Movements” to Shivaji University. Her areas of interests are Gandhian Studies, International relations and Western Political Thought. She is also a faculty member for the PG Diploma in Gandhian Studies at the Center for Gandhian Studies, Shivaji University. She has presented papers and participated in more than 35 Seminars/Workshops/Conferences at the State, National and International level. She was a part of the organizing committee of the International Seminar, “Making of the Mahatma: Gandhi in South Africa”, organised by the Dept. of Political Science and Center for Gandhian Studies. She has contributed to the development of SIM material of Shivaji University for two papers of B.A. (Political Science), viz. Government and Politics of India & Indian Political Thought. She has been invited as resource person on three occasions to other colleges. She has attended BOS (Law) meetings held for planning of the CBCS as invitee member. In the college she is actively involved in undertaking activities for the welfare and betterment of the students. She conducts Parents Meetings of the classes in her charge regularly. She also organises student visits to rural and urban local self governments and NGOs. She has coordinated several competitions in the college like essay competition, Gandhi Vichar Sanskar Pariksha, T-Shirt Painting, Elocution to name a few. She has also organised Legal Aid Camps at Shendri and Tardal when the college received funds from NALSA. She is part of the organizing committee of several workshops and programmes held at the college level. She is member of several committees of the college and was the secretary of the Magazine committee in the academic year 2015-16. Mr. Kailas R. Pawar is graduate from Sant Gadge Baba Amravati University and completed Masters in Archaeology from Deccan College Deemed University, Pune and Masters in Library & Information Science from Tilak Maharashtra University Pune. He has worked at SNDT Women’s University Library Mumbai and Pune for 8 years and appointed as a Librarian in 2011 at Shahaji Law College. He has participated in various Workshops, Seminars and Conferences. Mr. Pawar have been published 2 articles in National Seminars and edited a book on Tribal Stories. He has actively handling the Law College Library. 1 Dr. R. G. Panhalkar M.A., LL.M., Ph.D.
1 Adv. Dr. Santosh Shah MA., (USA) LL.M., (USA) Ph.D.
2 Dr. R. G. Pandurkar LL.M., Ph.D.
3 Mrs. S. H. Bhurke M.Com., LL.M. 5 Mrs. Vandana Samant M.Com.